While the Victorian era entertained tartans and the turn of the century hosted checks, it wasn’t until the 1920s that plaid clothing revolutionized the rules of urban style, following the English trend in which “country” began to impinge upon “town” in matters of male dress. Although some checks like the houndstooth enjoyed a distinguished career, none would become as enduringly stylish as the glen plaid. This classic plaid has a couple different names that you might know it by: glen plaid, glen check, Glen Urquhart plaid, Prince of Wales check, etc. It’s a woollen fabric with a woven twill design comprised of small and large checks. It is usually made of black/grey and white (or with more muted colors like faint taupes), often overlaid with a windowpane accent color (commonly sky blue, but also seen in lavender, red, etc). It’s a very subtle and muted pattern, making it a favorite among conservative businessmen. The name is taken from the valley of Glenurquhart in Inverness-shire, Scotland, where the checked wool was first used in the 19th century by the New Zealand-born Countess of Seafield to outfit her gamekeepers (hence the slightly more sporty feel). Glen plaid is also sometimes nicknamed the “Prince of Wales check”, as it was popularized by legendary style icon Duke of Windsor, while he was the Prince of Wales, of course. Still what is referred to as 'the Prince of Wales check', is when there is blue overcheck on the black and white Glen Plaid pattern. Today the glen plaid pattern is just as popular as ever, and it’s being used to make many different types of garments in menswear. 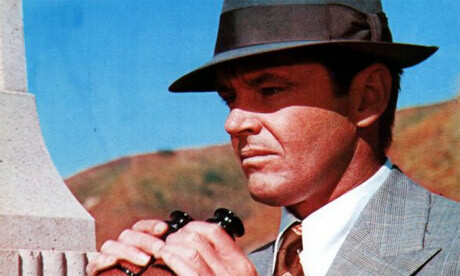 Jack Nicholson, as Jake J.J. Gittes in the 1974' movie Chinatown, wearing a Glen Plaid Suit. For the sartorial romantic, the Glen Plaid suit conjured up images of strolling in the fresh and radiant light of a spring morning. Its charm stemmed from the overall lightness achieved through a refined play of vertical and horizontal lines that intersected at regular intervals over a houndstooth check. Sometimes thin threads of bright color (red, blue, rust, pink) were woven through the checks. Although the Glen Plaid could flatter almost any physique, for tailors, plaids posed numerous challenges and additional costs. Their horizontal and vertical lines had to match up exactly, requiring slightly more fabric than the solid or striped two-piece. However, the plaid’s higher cost and complexity of production invested it with just the right allure to secure its position in masculine fashion mythology. Humphrey Bogart in a double breasted Glen Plaid suit.